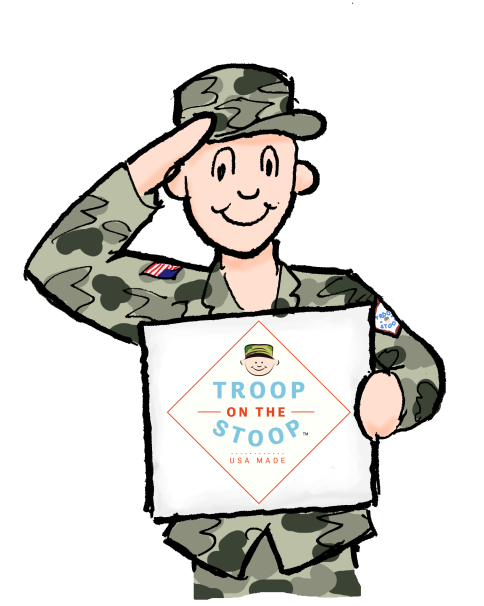 One of the projects I’ve been working on this spring was a children’s book I illustrated titled “Troop on the Stoop”. It was written by a fellow named Blake Wayman as a companion to a toy he designed. Blake is a former serviceman who works in Health Care with children. In his job, he sees a lot of children who are struggling because they are separated from a parent or other family member who is serving in the military. Blake came up with “Troop” to be a “battle buddy” for these kids; a friendly face when their loved one isn’t around.